Together we can make a difference in the lives of millions of Canadians. We invite you to get involved with Kind Canada. As a national not-for-profit committed to inspiring Canadians to embrace the practice of kindness in their everyday lives, we know that the contributions of many hands and hearts will make kindness a pervasive part of our homes, schools, workplaces and communities. Think about how you can be one of millions of Canadians to get involved with Kind Canada. Make kindness part of your day. There are a number of ways to get involved with Kind Canada. First, of course is to simply make a personal commitment to purposely include kindness in your daily life. Take the kindness pledge . Why not make your commitment to kindness an official one? 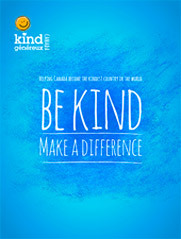 By taking the kindness pledge at Kind Canada, you will be adding your name to a growing list of Canadians who are willing to stand up and be kind. As a new not-for-profit organization, Kind Canada depends on many types of support, including financial. We are grateful and inspired by the people who have provided generous financial support from the very beginning. By making a contribution to Kind Canada you will be supporting our national goal of improving the health and well-being of Canadians through the positive impact of kindness. Improvement of the health and well-being of Canadians. A greater commitment to kindness by Canadians. An increase in acts of kindness in Canada. Sharing of the kindness experience among Canadians. Expanded opportunities for community engagement and participation. A global impact by working with other world kindness organizations. Your contribution will go towards outreach programs in schools, communities and workplaces, building awareness of the many health benefits of kindness and the availability of resources and information. 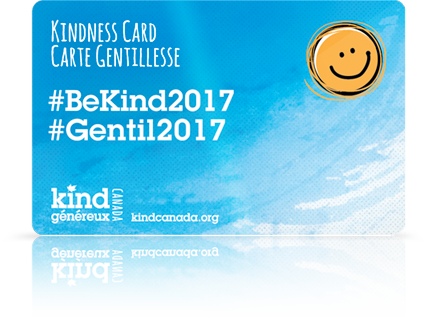 Become a card-carrying member of Kind Canada. We welcome individuals, companies and other not-for-profit organizations as members of Kind Canada. Memberships start at only $10 per year and include a number of benefits such as Kindness Cards that you can use to spread kindness. Visit our Become a member of Kind Canada page to find out more. Giving of your time is a great way to practice kindness, touch the lives of others and improve your health and well-being. Bet you did not know that last part. We welcome inquiries from people who would like to volunteer with Kind Canada in Ottawa as - - well as remotely. We also encourage volunteerism in general. If you’re looking for volunteer opportunities in your community, Volunteer Canada has a very helpful website for finding volunteer opportunities across Canada.